Meet the Team at Framed in Time! Pictured above from left to right (back row) are James Heroux, Rob Dziubek, Nancy Anderson, Jill Gustafson, and Lynne Johnson; (front row) Rosie Gutierrez, Hua Hu Wang, Monica Quintanilla, owner John Fournier, Marcia Deegler and Trish Mock. Framed in Time is a small business owned and operated by John Fournier, who personally has over 35 years in the retail and wholesale framing business and is a member of the Professional Picture Framers Association (PPFA). 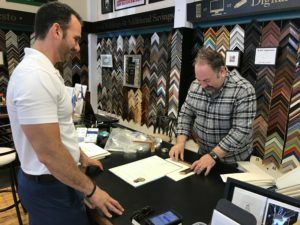 He has created designs that have won awards both locally and regionally and has been the winner of the “Readers’ Choice Award” for “1st Choice for Frame Store in Framingham” and “Regional Gold for Frame Store” for the past six years! Our skilled staff is comprised of artists, printing professionals, masterful framers and craftsmen and design consultants, compiling over 200 years of experience between us. Our clients include individuals, local artists, designers, collectors and organizations interested in preserving and displaying various forms of artwork and materials. In 2004 we opened at our current location at 2 Central Street in the historic Saxonville Mill Building and over the years have grown to be one of the most respected art framers in the region. We pride ourselves on putting our clients first and treating your artwork with the utmost care and respect. Our design and framing teams are expertly versed in the proper handling and care of all types of artwork. 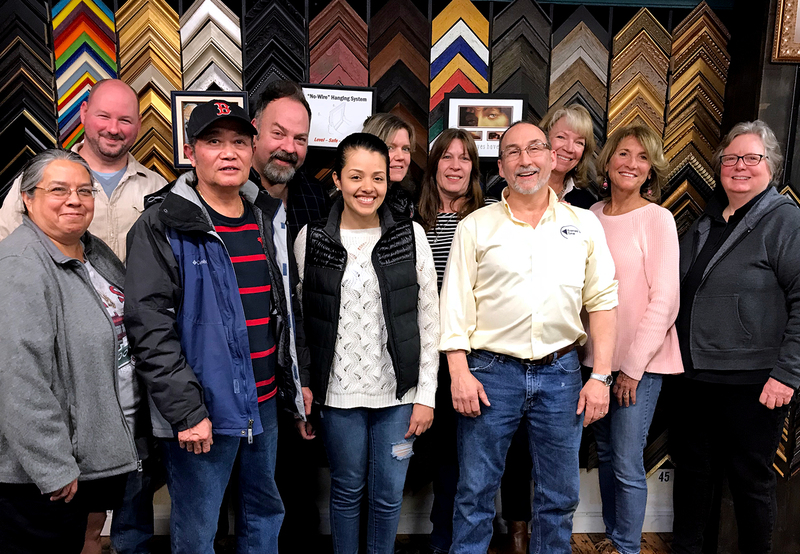 Our skilled team of professionals is dedicated to providing you with the most creative, friendly, and professional service to make your framing experience fun and enjoyable. Stop in and enjoy a sunny relaxed atmosphere and a cup of coffee or tea while we design your framing. We even have materials for your kids to create their own masterpiece! We are here to assist you through every step of the design process. Whether it’s a single poster, certificate or diploma, sports memorabilia or collage of family photographs, we will happily provide you with options for framing and preserving any item. We want to provide you with a quality product at a budget that works for you.